FORD, William David, a Representative from Michigan; born in Detroit, Wayne County, Michigan, August 6, 1927; attended Henry Ford Trade School, Melvindale High School, Nebraska State Teachers College, and Wayne University; B.A., University of Denver, 1949; LL.D., University of Denver, 1951; United States Navy, 1944-1946; United States Air Force Reserve, 1950-1958; admitted to the bar in 1951; lawyer, private practice; justice of the peace, Taylor Township, 1955-1957; city attorney, Melvindale, Michigan, 1957-1959; delegate, Michigan constitutional convention, 1961-1962; member of the Michigan state senate, 1962-1964; member and officer of the Sixteenth District Democratic Organization, 1952-1964; delegate, Michigan Democratic conventions, 1952-1970, and to Democratic National Convention, 1968; elected as a Democrat to the Eighty-ninth and to the fourteen succeeding Congresses (January 3, 1965-January 3, 1995); not a candidate for reelection to the One Hundred Fourth Congress in 1994; chairman, Committee on Post Office and Civil Service (Ninety-seventh through One Hundred First Congresses), Committee on Education and Labor (One Hundred Second and One Hundred Third Congresses); died on August 14, 2004, in Ypsilanti Township, Michigan. 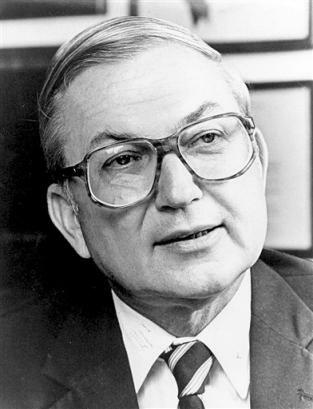 YPSILANTI TOWNSHIP, Michigan - Former U.S. Representative William D. Ford, a Democrat who spent three decades on Capitol Hill and dedicated himself to expanding educational opportunities for children, has died. He was 77. Ford died early Saturday at his home of complications from a stroke he suffered about six weeks ago, said Adam Benson, a spokesman for U.S. Representative John D. Dingell, D-Dearborn. A House member from 1965 to 1995, Ford served as Chairman of the House Committee on Education and Labor and as Chairman of the House Committee on Post Office and Civil Service. "He believed that the government has an obligation to give its citizens a chance at success," Dingell's office said in a statement. "He worked every day of his life to be the champion of the working poor and the middle class." He authored the Middle Income Student Assistance Act and the Plant Closing Act and orchestrated the passage of the Family Medical Leave Act. In 1994 The Federal Direct Student Loan Program was named for him. Ford was the oldest child of immigrant Scottish parents and the first member of his family to attend college. Following his service in the U.S. Navy he attended the University of Denver of the GI Bill. He was a delegate to the Michigan Constitutional Convention and a member of the Michigan Senate prior to representing Michigan's 15th and 13th Congressional Districts. Ford is survived by three children, three grandchildren, a sister and a brother. 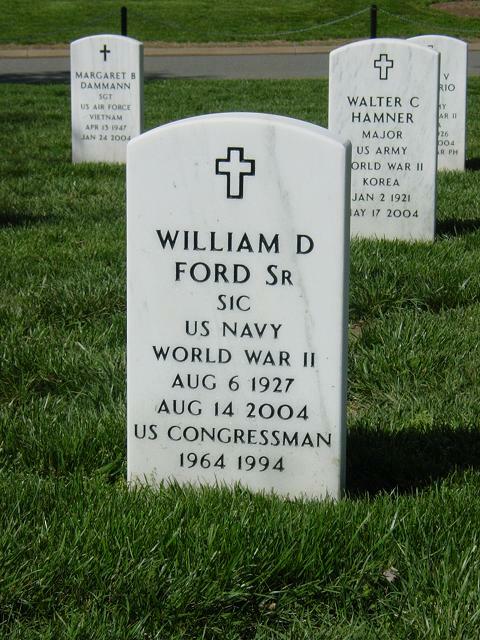 Representative William D. Ford, an old-fashioned labor and lunch-pail liberal who served his working-class Michigan district in the U.S. House of Representatives for 30 years, died Aug. 14 at his home in Ypsilanti Township, Mich., of complications from a stroke. He was 77. Representative Ford, a Democrat, represented Michigan's 15th and -- after boundaries were redrawn -- 13th districts from 1965 to 1995. He was chairman of the Post Office and Civil Service Committee and the Education and Labor Committee. Outspoken in his defense of everyday U.S. workers, whether in the automobile plants of his home district or in the halls of federal agencies in Washington, he was never shy about using the power of his office or his combative oratory to spar with members of Congress or administration officials. "He was a protector of working people," said former Representative William L. Clay, D-Missouri, who served with him in the House for 25 years. "His whole career was based on the notion of the right of people to join together collectively." In addition to his unflagging support of labor, Representative Ford was known for his efforts to increase educational opportunities for families of limited means. In his freshman year in Congress, he sponsored the Elementary and Secondary Education Act of 1965, which provided special assistance to poor school districts and was a key element of President Johnson's War on Poverty. In 1978, Representative Ford sponsored the Middle Income Student Assistance Act, which expanded the college student loan program. In 1994, the Federal Direct Student Loan program was named in his honor to recognize his efforts to broaden educational opportunities across economic levels. "Bill Ford was a great leader for the education of our children," Clinton said in a statement. "Thanks to his long leadership in the Congress, millions of families and children have much better lives." Representative Ford was not related to either of his state's better-known Fords: the auto-manufacturing family or President Ford. His father was a Scottish immigrant who worked in an auto plant and was killed in a factory accident -- a fact that influenced Representative Ford's thinking and politics throughout his life. 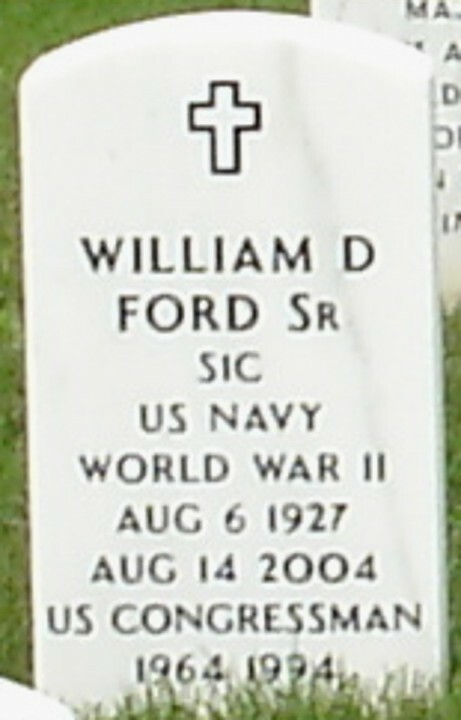 William David Ford was born in Detroit and served in the Navy during World War II. After attending an automotive trade school, he became the first member of his family to go to a four-year college. He attended Wayne State University in Detroit before graduating from the University of Denver, from which he also received a law degree. He practiced law in Taylor, Michigan, from 1951 to 1964. Survivors include three children from his first marriage, William Ford Jr. of North Grafton, Massachusetts; Margaret Ford Van Vleet of Cordova, Tennessee; and John Ford of Alexandria, Virginia; one brother; one sister; three grandchildren; and two great-grandchildren. There will be a public viewing and a memorial service in Michigan this week for former U.S. Representative William D. Ford before he is laid to rest at Arlington National Cemetery, U.S. Representative John Dingell said Monday. The viewing is scheduled for Tuesday between 2 p.m. and 9 p.m. at Voran Funeral Home in Taylor, Michigan. The memorial service, which is open to the public, is scheduled for Friday at 10 a.m. at Eastern Michigan University's Corporate Education Center. Ford is to be buried August 25, 2004, after a private service at the National Cemetery in Arlington, Virginia. Ford died Saturday of complications from a stroke. He was 77. Ford was a Democrat who served in the U.S. House from 1965 to 1995 representing Michigan's 15th and 13th Congressional Districts.